Pay it Forward 2011: I promise to send something handmade to the first 5 people who leave a comment here. They must in turn post this and send something they make to the first 5 people who comment on their status. The rules are that it must be handmade by you and it must be sent to your 5 people sometime in 2011. I took on the challenge and it didn't take very long for people to respond. I'm about ready to send off my handmade goodies to them. Want a peak as to what they will be receiving? 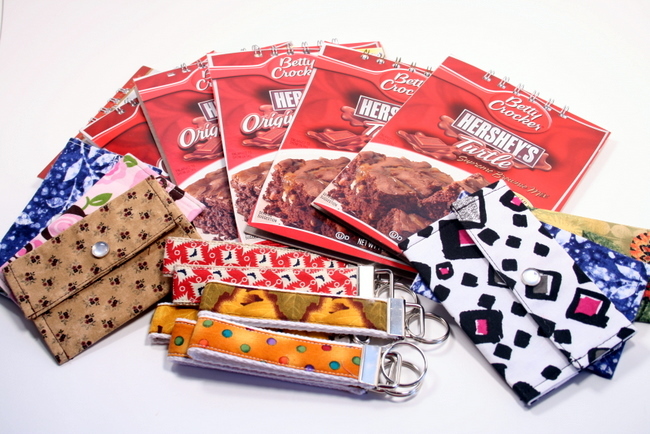 The homemade goodies include mini wallets, key fobs/rings, and memo pads made from upcycled food box chipboard. I will be mailing them yet this week so watch for them! My 16-year-old sister took on this project and made book safes (where you carve out the inside of a book, ao that you can hide something inside). What a fantastic idea! Your gifts are so neat. The book safes sound awesome! You are one talented lady, Rita! I just didn't know that!